From time to time, people ask about life aboard Winterlude, so I've included a few photos of how we live. As a point of perspective, from the head all the way forward in the left photo to the back of our living space is a bit over 18'. For our Y friends, we live in a space as long as a Y Flyer & twice as wide! If you can imagine!!! :) The top two photos show the main salon. 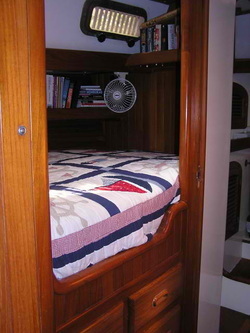 The first photo shows the salon from the galley sink area, you can also see through to the bow of the boat where the head (bathroom) resides -- in between is the bedroom & the separate shower. The cord showing to the bookcase is the a/c cord for the $80 Maytag room air conditioner that we only use a couple weeks a year, while we're at the dock in the Rio & there's no breeze to cool the boat. We probably get more questions about daily activities than anything else -- what do you do for a refrigerator??? We have an Adler Barbour Super Cold Machine (translation, refrigerator). It resides in a bottomless pit, no shelves or other conveniences of modern refrigerators, but it works! You can see we've taken some blue insulation from Home Depot & sectioned it off, creating a freezer on the left & the fridge on the right. I can even freeze ice cubes. 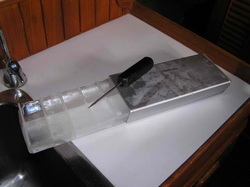 altho without any shelves, the ice cube trays have to sit vertically. If you look in the bottom right hand corner of the below photo on the left, you'll see the top of the vertical ice cube tray wedged against the cold plate with some chorizo sausage (I always have to wedge it to keep it from falling over). The other photo shows the wonderful 10 ice cubes we get from each batch! The nicest thing about these ice cubes is that they LAST in the intense tropical heat. Wimpy ice cubes just melt in your drink after about a minute, which is why many cruisers choose to do without the hassle of making ice. But these old fashioned big cubes cool the entire drink from start to finish! Really good on a hot, hot day in paradise! :) And yes, our freezer will freeze meat & keep a small amount of stuff frozen, I can probably keep 2 lbs of hamburger, several packages of frozen chicken breasts, some chorizo & longanesta and even the overflow fresh fish frozen indefinitely. The down side is, it isn't cold enough to keep ice cream, but such is life in paradise! Here's the galley, you can see the refrigerator is directly beneath the microwave, there's a pantry/cooler to the left of the fridge. The gas 3 burner Hillerange gimbaled stove (swings free underway to conteract the heel of the boat) -- you can just barely see the corner of the oven handle, but there's a nice little oven. It requires smaller baking pans than normal and it's bit of a challenge finding pans to fit. The oversize sink has both hot & cold pressurized water, a footpump for cold fresh water & a spout for filtered drinking water. Our water on the boat tastes better than our water at the lake! I may install a Seagull filter at the lake house too! 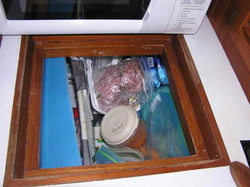 There's some cabinet space above the stove, fridge & the other storage well shows up on the other side of the sink -- you just lift out the lid & we have baking supplies, cooking stuff, tupperware, a case of coke & tonic water, etc stored there. There is no storage under the sink because the Spectra watermaker resides there robbing me of the extra space, but well, well worth it. To the right is our nav desk, which is great, but not quite big enough for paper charts. When we're underway, we'll use the salon table to put the paper charts on & the nav desk will be running Nobeltech Passport charts on the laptop ... plus we'll use the Garmin GPSMap 76C with Bluecharts at the helm -- it's tiny screen isn't good for planning but nice to have at the helm. On the nav desk from far left, on the facing wall, if you look closely you can see the round Link 10 energy monitor, then the battery charger display. On the back wall is the Icom M802 SSB/ham radio, below that a Jensen CD player, the Furuno radar is in the middle & a Furuno GPS top & Icom M502 VHF completes the nav display panel. To the far right is part of our electricity panel, both AC & DC. Under the desk, out of sight behind the trashcan is the inverter & the KISS switch to channel excess energy into our water heater from the wind generator. Also on the desk itself you see a switch in the bottom left corner of the photo, that's the bilge pump switch. The laptop normally resides where you see it on the desk. And finally, here is our bedroom. The bed itself is a pullman berth, which we much prefer to a V berth -- since it's not wedged into the bow, we have a less confined space for our feet. The total length of the bed head to toe is 80" and the width at the widest part is 48" -- quite a departure from our king size bed! But cozy & comfy - the reading lights above our heads are nice, as is the rotating fan at our feet when it's stuffy at anchor. David just replaced the fan, it was part of our 180#s of stuff we lugged down -- the other fan quit rotating last winter. An interesting factoid ... I bet you didn't know that making a bed qualifies as high aerobic exercise with weight training thrown in for good measure. 20 minutes later, I'm always sweating & cursing! Here's is the hatch above our bed. This is the location where the bad guys broke into Winterlude in November 2006 in Utila, Honduras. You can see that now we've added stainless bars across the hatches. 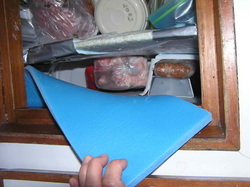 They are custom designed to be removed quickly and easily in case of fire inside, but are impossible to get out from outside the boat. This will allow us to leave a hatch open when we leave the boat for air and also allow us to sleep with the hatches open without having to fear intruders. 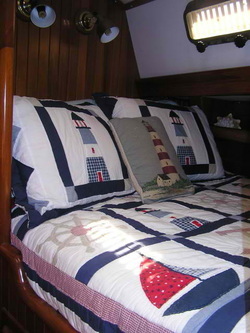 Altho' truth be told, we've always left our hatches open when sleeping and never once been afraid of intruders. 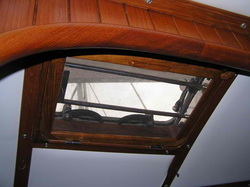 We do always secure our solid wood companionway door though, no use asking for trouble! Catamaran Hotel & Marina, Winterlude's home away from home. You can barely see the dark hull through the mass of boats, currenly we're on an inside dock. To the right of the boats is Kevin's house, Catamaran's owner & to the left are some of the delightful little bungalow rooms rented by the Catamaran Hotel.